Alto Aviation, whose high-end audio systems are standard equipment in many business jets, is highlighting at the NBAA Convention in Orlando its recently TSO’d Acapella series amplifiers, showcased in dramatic fashion along with Alto’s complete line of audio products in three full-scale cabin configurations at its exhibit (Booth 725). The small-, midsize- and large-cabin mockups give attendees a chance to experience the nVelop surround-sound technology of Alto’s amplifiers, loudspeakers, subwoofers and page/chime speakers in their individually tuned installations. The Acapella series amplifiers represent “a breakthrough” lightweight model, according to Alto, supporting four or eight high-power speaker outputs, up to 10 headphone locations and single and multiple source inputs, as well as volume control, speaker on/off and PA override. The company sees the Acapella system as an ideal solution for small aircraft without an inflight entertainment (IFE) system installed. Company president Don Hamilton said that Alto Aviation has an OEM launch customer, though he declined to identify the company. Alto also sees a strong demand in the aftermarket. “Think about how many Cessna- [Citation] or Lear-size aircraft with no audio [systems] are flying,” Hamilton said. Acapella also has the flexibility to interface with a previously installed IFE system without using third-party interfaces and minimal modification, making it ideal for retrofits. As for pricing, Scarlata said Acapella is “very, very affordable,” noting that having four channels instead of the usual eight keeps costs down, as does the reduced size and complexity of the amplifier. As for installation, “You can upgrade the existing speakers with minimal changes to the interior,” he said. The speakers are surface mount and require only a simple cutting of holes, and speaker enclosures match the size of popular but older speakers made by a competitor, simplifying retrofits. Control panels are low-profile surface mount instead of inset, further simplifying the installation, which can be completed in one day, he added. Acapella isn’t wireless, but the company is “working toward wireless,” Scarlata said. “We’re very aware of the desire for simple controls.” The systems that Alto supplies to Gulfstream, Honeywell and Rockwell Collins are wireless. Hamilton and Scarlata were formerly employed by Bose and ultimately assigned to work on the cabin sound system the company created for Gulfstream. When Bose left the business in 2000, the pair proposed supplying a system of their own design, and Gulfstream “gave us an opportunity,” Hamilton said. The pair designed an amplifier that became standard equipment in Gulfstreams. (When it left the aviation amplifier business, Bose officially endorsed Alto Aviation as the industry’s preferred audio system supplier.) Late in the last decade Alto began making complete audio systems with speakers as well as amplifiers. Today Alto’s audio entertainment systems are offered as standard equipment on the Gulfstream 650/650ER, G450/550 Elite Series and G280, Dassault Falcon’s 7X, 900 and 2000, Embraer’s Lineage and Legacy series, Cessna’s Citation X+, Sovereign+ and other models equipped with its Clairity CMS, and Sikorsky’s S-76 and S-92 helicopters. 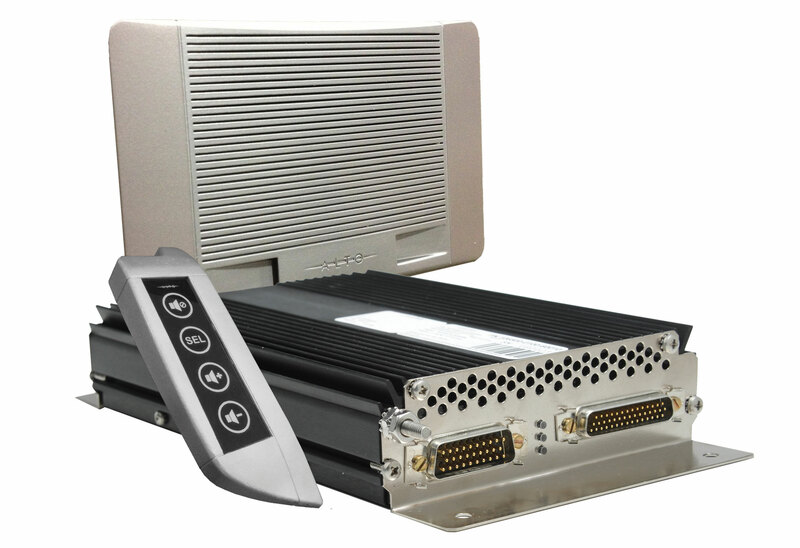 Alto also provides the amplifier and speakers for Honeywell’s Ovation and Rockwell Collins’ Venue systems. Its systems, all TSO’d, are also popular in the refurbishment and completions markets. In total, more than 2,500 aircraft, from King Air C90s to Boeing Business Jets, are equipped with Alto audio systems, according to the company. Every Alto audio system is custom designed specifically for each cabin installation. “Through installation support and tuning, we visit each aircraft and do extensive acoustic measuring, then custom contouring,” said Hamilton. “It takes us a day. In the end we’ll evaluate every seat in the aircraft and let the customer or customer’s representative audition the installation.” Alto can also customize amplifiers to ensure proper tonal balance and dynamic audio reproduction. Hamilton said that audio quality has become a much more integral component of the onboard experience, which he attributes to advances in high-definition video. “It’s helped push the audio side, and expectations are high” for cabin sound quality, he said. Alto has developed proprietary software that can acoustically map the interior of an aircraft and create a model in the computer’s database, allowing engineers to predict the interaction between the audio system and the cabin interior. Alto uses the data to choose the optimum speakers and speaker locations for each installation, as well as to model electronic hardware digitally without have to build the components. Traditionally, high-end audio components have been large, heavy and power hungry, but overcoming the acoustical challenges of an aircraft cabin requires small, lightweight speakers. In addition to their high sound quality, Alto claims the smallest and lightest speakers, subwoofers and audio amplifiers–all DO-160 tested–making them ideal for aviation applications. The growing demand for high-quality audio is helping fuel Alto’s growth. This year the company increased by 50 percent the space of its Jupiter, Fla. office, where its engineering, field-testing and product support work is performed, and by the end of this year will more than triple office space at its Leominster, Mass. headquarters. “We really are expanding and working on a lot of new products,” said Scarlata. Here at the show Alto’s audio engineers are eager to meet current customers, as well as MROs and system integrators “so they can learn more about our products,” he said.